"I did not conquer the Pacific. It let me go across." "I have chosen the ocean as my field of confrontation, my field of battle", writes d'Aboville, "because the ocean is reality at its toughest, its most demanding. As my weapons against this awesome power, I have human values: intelligence, experience, and the stubborn will to win." pain and anguish, of bravery and utter solitude, a tale that ends in his victory not only over the "enemy"-the implacable ocean- but also over himself Gerard d'Aboville was forty-five years old when he set out on his improbable mission: to row across the Pacific Ocean, from west to east, from Japan to the United States. 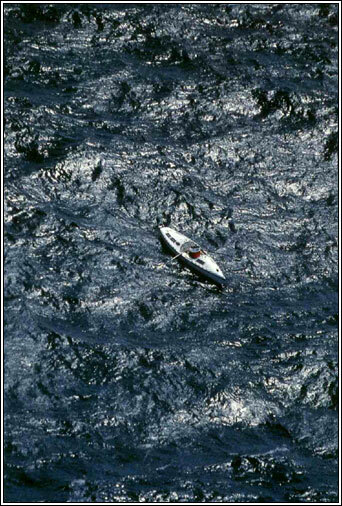 He had already rowed across the Atlantic, from Cape Cod to the port of Brest, France. But that had been ten years before, when he was in the prime of life. Still, the nagging challenge of the Pacific - twice as vast as the Atlantic and several times as dangerous -would not be denied. His rowboat, the Sector, was 26 feet long. The ocean was 6,200 miles wide. His watertight living compartment, a scant 31 inches high, contained a bunk, a one-burner stove, a ham radio, and a telex (both powered by solar panels). Fresh water came from two desalination pumps. conditions that life imposes on them. the ability to dream and to hope. adventure - this ocean voyage - may serve to re-kindle in their hearts a spark of hope. D'Aboville, short and compactly built, is no more phys-ically prepossessing than another fairly obscure and just as brave long-distance navigator, the paddler Paul Caffyn of New Zealand. Over the past decade or so, Caffyn has circumnavigated Australia, Japan, Great Britain, and his own New Zealand through the low pressure systems of the Tasman Sea in his 17-foot kayak.In a memorable passage in his book, The Dark Side of the Wave, Caffyn is battling a horrible chop off the North Island and sees a fishing boat up ahead. He deliberately paddles away from the boat, fearing that someone on board will see his flimsy craft and ask him where he is going: "1 knew they would ask me why I was doing it, and I did not have an answer. a capsize. The boat had few creature comforts but all necessities: a stove, a sleeping place, roomy hatches for dehydrated meals and drinking water. D'Aboville also had a video camera and filmed himself rowing, in the middle of nowhere, humming the Alan Jackson country-and-western song ''Here in the Real World." D'Aboville sang it and hummed it for months but did not know any of the words, or indeed the title, until I recognized it on his video.